My buddies, like most kids, LOVE playing with shaving cream. Even when buying it at the dollar store, shaving cream can become a pretty pricey play material if used frequently. I wanted to find a play material that had the appeal of shaving cream but would be inexpensive enough to use every day. One of the things we had done in the past was to use a mixer to fluff up ivory soap and water (after the microwave experiment). The soap foam was a wonderful play alternative to shaving cream, but wasn't something I wanted to do every day. Then I thought about our foamy soap dispensers. I refill mine and it makes a little liquid soap go a long way. 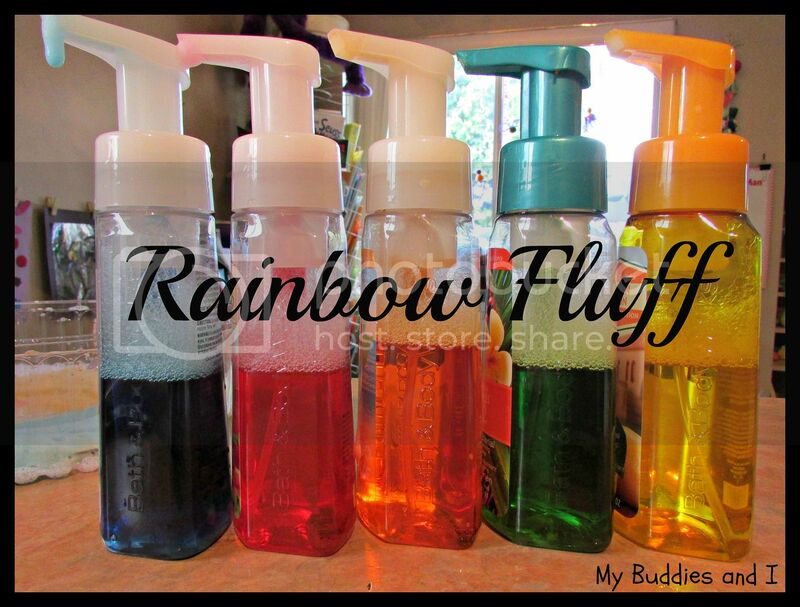 I asked people to save their foamy soap bottles for me and when I had a few, I made a set of coloured soap bottles. I used a teaspoon or so of clear liquid soap (shampoo, hand or dish soap, whatever!) and some liquid watercolour and slowly filled with water. I set the coloured bottles and a clear plastic tray out for my buddies to play. They LOVED them! And we were able to take this activity outside, too. Even though it's cooler out, they didn't really get wet or cold. 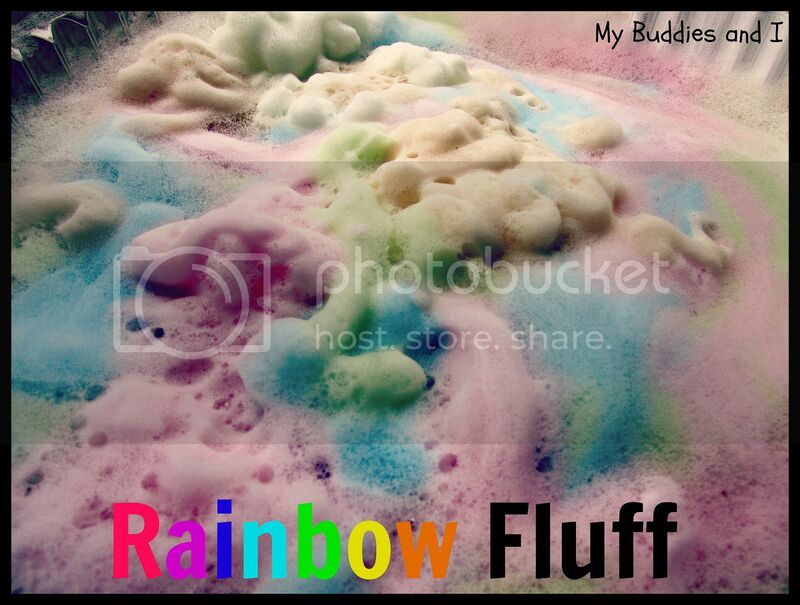 They just squirted the foam into the plastic tray, layering foam colour onto foam colour and making a big foamy mound of rainbow fluff. This stuff was too much fun to play with only once, so we repeated the activity the next week. I love that it is inexpensive enough to do this! This time, I added a few more clear containers and a bottle of white fluff. The squeeze pumps really get my buddies using their hand muscles while they pump the coloured fluff into the trays. They will be nice and strong when they need these muscles for printing! 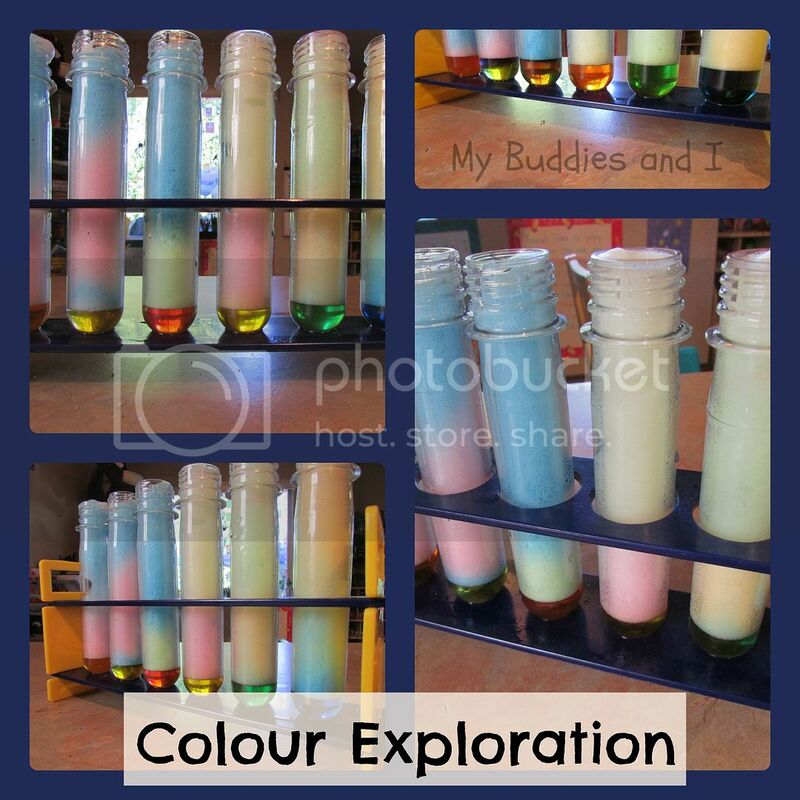 They don't know it yet, but next time I'm adding the test tubes that we got from Steve Spangler Science for them to layer colours in. I think they will enjoy watching the colours melt together. I hope you will try this activity out with your little ones. 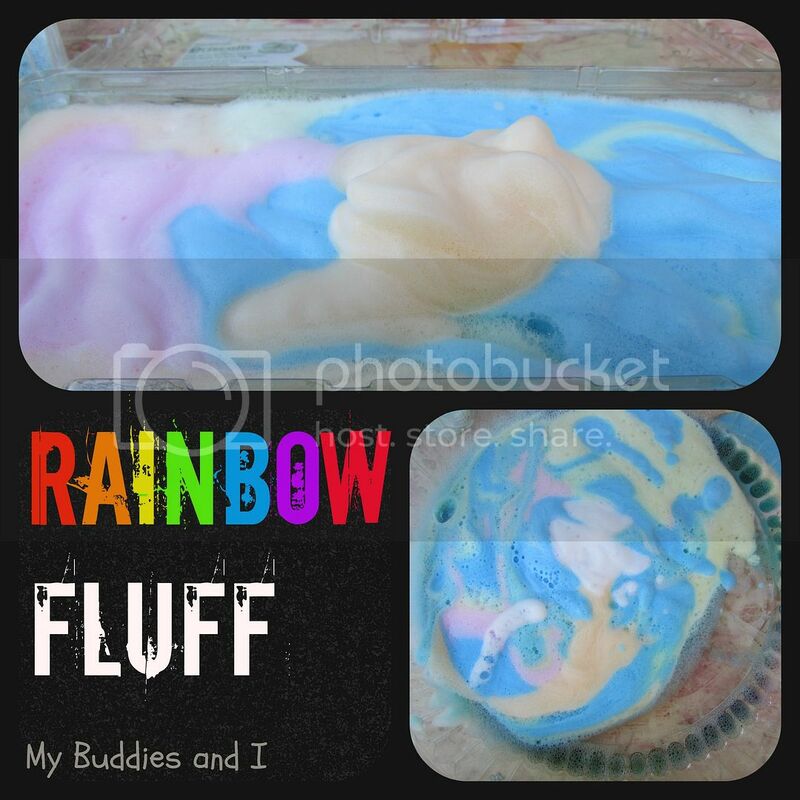 It's so easy, inexpensive and FUN!